There's just something magical about the Colorado Rockies - and my family's ties with this colorful state run deep. 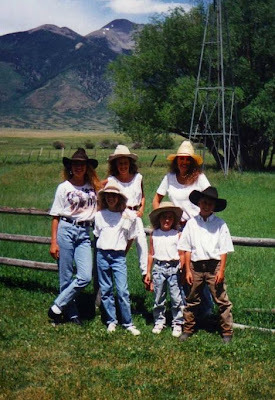 I know my great grandmother, Grandmom Ivy had a ranch in Colorado and I can remember visiting it - well after it had been sold - the new owners more than willing to let my mom tour the place that held so many of her childhood memories. Some years after the ranch - mid to late 50s - my grandfather, Robert Escar, discovered a mountain lake perfect for catching Rainbow Trout and surrounded by the majestic collegiate Peaks. He began routinely taking his sweet little family to Taylor Reservoir during the summers. 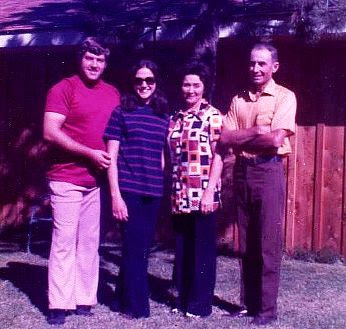 As newlyweds my parents continued his tradition easily enough, as they lived in Denver, and could escape to the mountains on the weekends. Visiting the Rockies proved more of a challenge for my parents, however, once they moved back to Texas and began having children. They had lots of children (6) and car space - even in a Suburban - proved scarce. But the challenge intensified the joy - and Christmas morning presents couldn't compete with the excitement my sister and I felt the night before a trip to Colorado. We would stuff our pillowcases full of dolls/doll clothes, books, and stuffed animals (and later tapes, headphones and magazines), totally breaking the "one toy" rule set by my parents earlier that day. We would wake up unbelievably early - the Texas air already thick with heat and humidity - and try to help my poor outnumbered parents pack 6 kids, a huge cooler, bags of whole foods snacks and a million suitcases in the car before sunrise. That was our goal - to leave while it was still dark. Somehow, my parents did it though, every summer. And Colorado would lay before us, promising relief from the stifling heat, and from the stress that accompanies trying to provide for and raise a large family. I introduced my husband to Colorado the year we married. We went in the winter this time, and although Bobby is incredibly athletic, he had had limited skiing/snowboarding experience. His approach was to tackle these new endeavors head on, full force. We laugh to this day at a video of him crashing into a grove of trees on a sled. 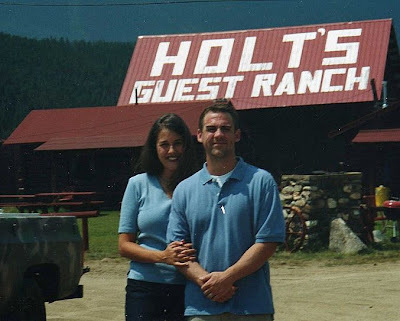 A couple of years later, Bobby and I drove to the mountains from Chicago. I was a bit disappointed - the drive was different. From Tx, you drive up from the base of the Rockies - small foothills becoming bigger and more beautiful as you approach Ra ton Pass. From Chicago you drive through Iowa - which is sort of hilly and really green - and then through miles and miles of flat cornfields being drenched in pesticides. The mountains don't start until you reach Denver - which really doesn't lend itself to the same type of build up as the TX trek. But it still proved a wonderful trip - the perfect anecdote to city life. This summer our Colorado trip was scheduled for August. We live in a small town now - surrounded by farms - and the weather this July has been unseasonably cool. I was excited to see my family - but wasn't feeling the desperate pull to get to the mountains that I had in years past. Plus, I had just found out that was (am) pregnant. I found out because of a pervasive nausea. The thought of driving 1000 miles seemed daunting. But I did it - to see my dear family - and in to continue a 50 year tradition. To be honest, I wasn't expecting much. We took I-70 west from Denver, however, and I became giddy. Bobby and I could smell the pine trees and caught a bit of a passing mountain rain. The temperature dropped, huge peaks loomed ahead, and we could feel our ears pop as we climbed. It was magical. By the time we got to the cabin - I was transformed. There's just something about the mountain air that makes you feel alive. The people in the mountain towns know it - and have moved there because of it. In addition (or intead of) their day jobs, they rock climb, bike, hike, raft, ski - they're all fit and tan and you know their toddlers wear merrils and can snowboard. Organic food stores abound and you can almost see that healthier version of yourself hiking one of those 14,000 footers. And then we get there - the last to arrive - welcomed at the driveway by a huge crowd. My siblings have families and busy lives now - the fact that we are all there, together is amazing in and of itself. And so the week progressed - too quickly. We slept in, read on the deck, swam in the natural springs, biked, took walks and shared many lovely meals together. At night we played games and laughed until we couldn't see straight. Magical, indeed. Jenn - remember the high side summer when you were a Hubby? I loved that trip. I looked for that Colorado picture to scan, but couldn't find it! I love the family traditions. So beautiful. Your post makes me miss the cool mountain air of Alaska, where the snow is currently dusting the mountaintops as I bake in hot and humid Ohio. Congratulations on your pregnancy!!! When are you due? So good to hear from you, Ser! I love, love your last blog. I read to Bobby and he laughed out loud. I'm just a couple months pregnant - sick every single day though. Only just checking back now. I'm due Dec. 22. I'm so sorry to hear you are sick! I thought I might not survive the first part this time, but here I am, feeling great. Hang in there!